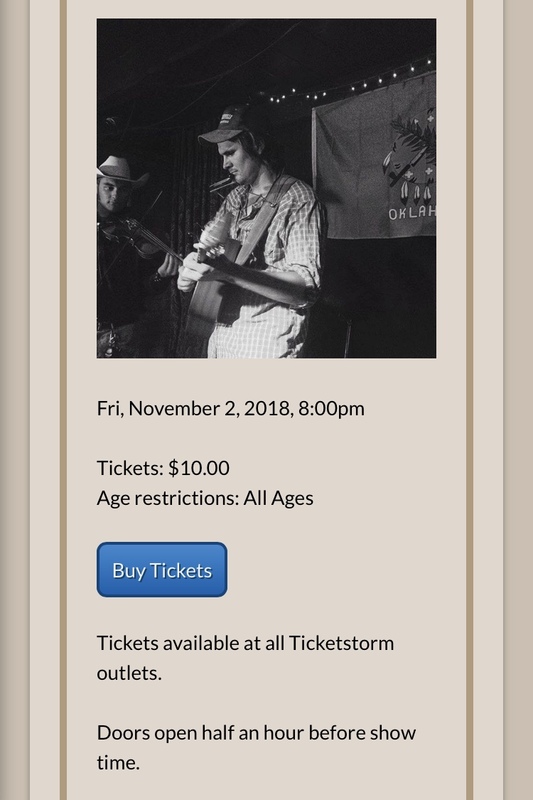 Dan Martin and Beau Roberson will be having an Okie song swap at Oklahoma’s premiere listening room, The Blue Door, on Friday Nov. 2nd. If you aren’t familiar with Martin, you should do yourself a favor and look him up. I got the chance to pick his brain for this article recently. “I usually play either solo or with lead guitar player Gene Williams. The gig at the Blue Door will be a song swap between me and Beau Roberson. Gene will back us both up,” said Martin. Martin has been been playing gigs since 2014. He put out his first record in 2015 titled ‘Hoka Hey’. He’s currently in the process of finishing a second record. “The songs on this next record I feel are far more complete than the ones on the first,” said Martin. He says that his musical travels have taken him from coast to coast and even overseas to the Netherlands. I asked him what his songwriting process was. Martin says the most unusual inspiration for a song so far has been a song from the eyes of a cockroach, titled "It's Just Me". I also asked him what musician he would love to collaborate with. “Any musician that can value a song over their egos, and being a human over a song, and existence over being a human,” he said. Martin says that “The Cape” by Guy Clark is a good theme song for his life. I asked him what was the most interesting thing he’s learned about himself this year. You can keep up to date with Martin on his website at www.danmartinband.com. Martin released his debut album (produced by Mike McClure) with philosophical honesty ascribed to the life he has experienced and the places he has seen. “Alive don’t mean winning”, Martin states on the opening track “Hoka Hey”. The phrase “Hoka Hey” itself translates from the infamous battle cry from the Sioux warrior, Crazy Horse, meaning, “It is a good day to die.” Thoughts like this bloom throughout all ten tracks, giving listeners a surplus of opportunity to climb into the pictures Martin paints; all the while enjoying a folkie Boohatch Studio and Horton Records production. These tracks possess an acoustic comfort that can be credited to the musicians performing on the record. A listener will find Cody Woody, Kevin Smith, and Jacob Flint at the forefront of enhancing these poetic melodies into Folk/Americana luminosity. “Hoka Hey” gives the back-porch listener ambition to travel the frontier of spiritual and psychological growth. Singer songwriter Beau Roberson is a rapidly rising star in Tulsa. He leads the band Pilgrim who had a long standing Sunday gig at The Colony bar in Tulsa, OK for a solid 3 years starting in 2008. This recurring gig was instrumental in the development of the band with the result being an incredibly tight live unit with a solid fan base that grew with the band as they evolved. It’s more of that Tulsa music mixing rock, funk, country, and blues with a high-energy, tight delivery. Don’t miss their live show. Make plans now to come check it out!